Junk Mail. Short story by Aaron Heil. September issue. The Write Launch. Justin texted me that from his bachelor party alongside a picture of himself fishing on the white rock beach at Milford Lake. Ben probably took the picture, because Justin had a pole in both hands. A catfish’s pale crescent belly arced above the water’s surface on a straight line back to Justin. A print of it hung on the fridge, first in my bachelorette pad, and then in our first house. We had replaced it temporarily with a postcard from Broughton-Randolph Custom Weather. I discovered the blue postcard with a white lightning bolt descending from a white sun printed above the words “Broughton-Randolph Custom Weather” inside a menu from Ming’s Wok. No date and no return address. Ming’s sends menus every month so they piled up if I wasn’t careful. The postcard slid out with a glossy “whop” sound when I moved that menu to the trash. It had a gnawed-off corner, like Kansas, and the logo in the middle. “Baby, what’s this?” I hollered at the wall between the kitchen and garage. “Wedding invite from Ben and Shannon.” Then, Justin’s blender roared. Justin’s cousin Shannon had agreed to marry Ben months ago. As a way of saying thanks to our local community, we’re giving away free services! You are eligible for free, custom weather events in your area. Offer valid through December 31, 2018. Limit twenty-five square miles of weather. Enter promo code MORENA online at broughtonrandolph.com. Have a great day – you decide when! I entered the garage. I tried to brace myself, but my nose cringed at the sharp smell. I had banned Justin from making stink bait – a rotten meat smoothie that catfish love – in my kitchen. I draped myself over Justin’s shoulders until he quit watching the whirling bait. “What?” A wet kiss dropped on my hand. Nonetheless, his blender stayed quiet while I typed it into my phone. Their website asked for all the specifics: the date; time; location within Clay, Dickinson, Geary, Riley, Pottawatomie, or Wabaunsee counties; before it even offered me rain. Rain came off of a precipitations menu, but I used sliding scales to adjust the amount as well as the wind speed. The website offered a quantity box for sunshine. I scheduled rain for August 5, and I cast it around Milford Lake. Ben liked to joke about getting married there, but the idea captivated Shannon. I typed “11” in the sunshine box. A final button at the bottom placed my order. I tapped it. When it asked for a promo code, I entered MORENA. The screen took a minute to reload before it thanked me with the white lightning-sun logo. Two weeks later, work made me hungry for Kung Pao chicken. A client insisted on a color scheme for his website that reminded me of the postcard. I brought it to the office, partly because my boss worked at a local print shop before she started a web design firm. A lot of her contacts went paperless and came with her, but not Ming’s Wok. “Maybe Ming’s launched a new ad campaign,” she suggested. Justin didn’t do Chinese, so I only ate Ming’s after an awful day or for a lunch out. Or when Justin fished through supper. I parked on the cracked asphalt while the other customers drove by the window. As usual, the manager worked the register at lunch. He knew my name. I never learned his, but I recognized his face. I kept that day’s receipt in my purse until the ink began to fade. First, I filled a vase with water, then a jar, and then a pan. Justin brought home flowers and a bag of red potatoes. One of the potatoes had a laughing face of three dimples, so Justin felt compelled to invite the potato and five spud friends over for dinner. We suspended Mr. Potato Head above the jar on toothpicks. I salted the pan water and began peeling his friends. While I cooked, Justin pulled some laundry from the dryer. He began folding on the table even though we’d be eating soon. I baked some catfish from the freezer on a cookie sheet because we had eaten them both fried and grilled recently. We got married at the country club. Broughtonrandolph.com generated error screens on my computer. I punched in the phone number from the postcard. A knife clattered off the table when the dial tone screeched and the robotic voice screamed in my ear that the phone number had been disconnected. I tried different browsers again and again. I restarted the computer. I remembered that I had ordered from my phone, so I looked for the link in my browsing history there. Safari didn’t load the page either. Every time, I got a message telling me that no such website existed. On the stove, the pan steamed. I went back to cooking while Justin goofed around on my laptop. Google searches for Broughton and Randolph eventually produced a K-State history professor named T. Avery Mall who had written a book, Broughton, Kansas: A Forgotten History, that I borrowed from the library. One Friday when I beat Justin home, I grabbed a Mike’s Hard and started digging. I let the bottle’s condensation soak my forehead. In the early chapters, Clay County farms and a village named Morena coalesced into Broughton on the banks of the Republican River. It used to flood yearly. The river hydrated crops. People caught catfish in their backyards. However, out in Abilene and Clay Center, the floods destroyed property, so the government built lakes. They conducted the Republican into a reservoir, named it Milford Lake, and created a floodplain with Broughton in the middle. The town evaporated in the 1960s as people moved away from a doomed valley. The index didn’t name Broughton-Randolph Custom Weather, but it directed me to twenty pages about Randolph alone. Out in Riley County, Tuttle Lake formed much like Milford did. The underwater Riley cities rebuilt themselves – named after the largest – as the modern Randolph on Google maps. About a mile away, Old Randolph’s ruins poked above the waves. I finished my research. I checked the freezer for beef to serve with leftover mashed potatoes. A car door slammed in the driveway. I couldn’t eat catfish again this week. Then, Justin’s blender whirred. In the garage, I found Ben alone. Ben took a beer from the fridge. I saw his eyes stop briefly on the postcard. We waited for Justin outside on lawn chairs. Small talk bubbled up. I still liked website design. Ben didn’t hate landscaping. Shannon had to study for finals tonight, so he came over to play video games. “What’s up with the postcard from Randolph on the fridge?” Ben asked. Justin’s truck rounded the corner then, and we watched him come in. He had a dead phone and a spare tire on the back right. Justin decided we would hit Walmart the next morning. I called the pizza guy while the man-children settled in front of the Xbox. Ben and Shannon didn’t send real wedding invitations because they made a Prezi. Justin forwarded the link to my computer and a glorified PowerPoint sucked me down a seizure- inducing rabbit hole of pinwheeling engagement pictures that eventually relayed that the wedding would take place at Milford Lake and the reception would follow in the same spot on August 5, 2017. I wanted another postcard for the fridge. On the Fourth of July, Justin’s relatives gathered in his Uncle Charlie’s home to discuss the new technological innovations in the wedding process. Cost-efficient invites, some marveled. Save the trees, others parroted. Way too many people found that joke hilarious. The family’s laughter echoed around the backyard in the thirsty sunshine. I drifted back, carrying another plate of saucy, dripping wings, to the beer cooler where Justin and Ben and Justin’s cousins lounged on folding chairs. The layer of ice cubes prickled my soaked hand when I grabbed myself, and Justin, a cold one each. I passed the beer to Justin, engrossed in the conversation, and he grunted. Something nabbed me. Apple shampoo flicked my nose. I turned and saw blonde straightener curls and a sorority tank and Shannon all at once. “Oh, woah, didn’t mean to make you jump.” Shannon had my elbow. She conducted me away from the boys. I glanced back at the apologetic grimace on Justin’s face. In that story, I’m the lump. Before, Justin had said that I am not a lump but he didn’t right then. I tried to ignore him and listen to Shannon. “Thank you.” I beamed. Most girls would ramble about that evening, but I wrote a haiku instead: I got married on a crepe-paper lined golf course. Magical night. “You can make them from old vodka bottles and glowsticks,” Shannon said. “So Renee woke up, all howling, and we turned around, and there’s Justin wearing nothing but a flashlight!” Ben crested on an echoing wave of hoots and guffaws. Ben never told that story right. He always left out the part where I booted him square in the testicles. Shannon, his co-conspirator, didn’t find it funny either. Today, she looked like she had a fragile bubble of prenuptial happiness surrounding her. I decided to ignore Ben. “Let me show you the centerpieces from Justin and my wedding,” I said. I scrolled through my Instagram posts and came to the mason jar/candle mashup I found on Pinterest. I talked her out of vodka bottles, but she wouldn’t budge on the glowsticks. Maybe, as a little girl, Shannon just dreamed about a rave-themed wedding. Kung Pao chicken displaced my homemade dinner date plans when Justin texted me from Kite’s. In college, he and I went to the Aggieville location to watch basketball games. We would huddle alone at our table as crowds eddied around on their way to the dance floor. Justin started going to the Junction City Kite’s with Ben after we moved into our first house. By July though, pro basketball had finished. So I texted, then called, then waited twenty minutes for Justin to respond before I left the house. The manager at Ming’s looked surprised but said nothing when I doubled my usual order. I opened the door to Kite’s with a greasy paper bag in my hand. My eyes skipped from tables, booths, to the bar, but I didn’t see Justin. Ben popped out of the men’s room. I thanked him, took the gift and left without opening it. Anger numbed me. Justin gave me a confused look as I set the bags on the kitchen table. He held a box of fettuccine in his hand. “I thought you said you wanted to make pasta,” Justin said. His hand snatched and grabbed at the plastic bag. A blue, cotton T-shirt slid out. Justin tossed it on an extra chair where it lounged like a guest, and gave a clear view of the white sun and lightning logo across the front. He reached for the Kung Pao chicken. He stabbed into the fried rice with a fork, and didn’t say anything for a few minutes. He played with a sliver of chicken. “I feel bad enough about the weather thing already,” Justin said. On August 5, the air smelled like dust, the sky had no clouds, and everyone who didn’t wear sunglasses squinted until evening. Milford Lake had the same color and motion as a piece of slate. My pale skin burned in the heat despite the efforts of sunscreen. Justin served as Ben’s best man. I volunteered for everything else. Set up tables? I did it. Tablecloths? Nice and straight. Rocks to weigh down the tablecloths because we don’t have enough jar-lamps ready? Sure, but after that I grabbed the unopened glowsticks and unused jars and stole away beneath black walnut trees that overlooked the lake. I realized I didn’t have scissors and then I heard a click. Justin had followed me into the trees. He had brought a pocketknife. “It’s Ben’s day with you,” I said. I sliced around the edge of the tube. The liquid slowly flowed into the first jar. 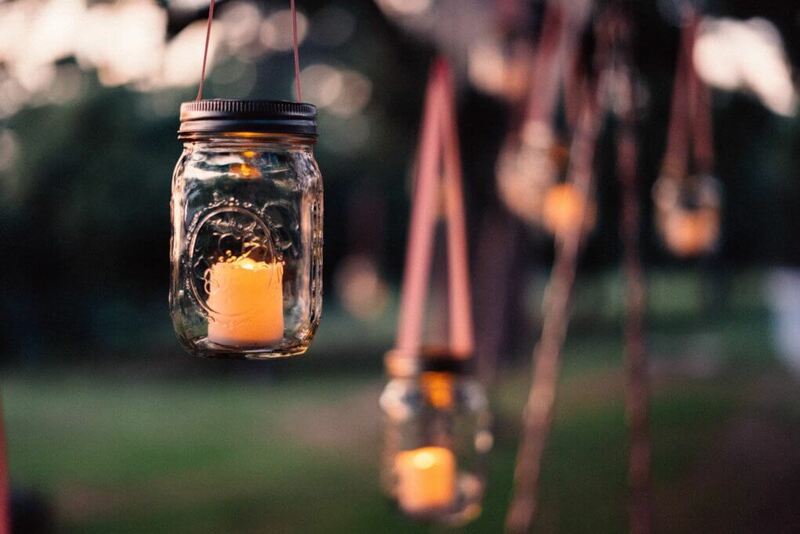 And soon we had a row of jars that glowed, softly under the heavy leaves, as green as the summer walnuts themselves. While Justin and I worked, the wedding photographer danced in and out of my peripheral vision. We found out later how eerie the shot looked: Justin and I sat down in shadow surrounded by a lot of little bottles of lightning. Each bottle – from the vintage Ball jar to the jelly jar with Daffy Duck’s face on it – had it’s own personality animated by the glowing liquid inside. I finally saw why Shannon loved the idea so much. We set them on the vacant card tables and folding chairs that radiated around the sheltered picnic table that the state of Kansas provided. We had it all ready an hour before the service. A blessed breeze crept into the day, and slowly everything began to cool. The surface of the lake had looked opaque until the smallest kiss of wind generated rippling waves. Light began to bounce off Milford’s gray water. “It’s going to cool down for the service.” Justin wouldn’t say the “R” word. I felt a pinch on my arm. A mosquito, a creature born in the water, whined past. After I slapped at it and missed, Justin kissed my hand. My arm still itched, but I didn’t want to ruin his gesture. When the day transformed, just after the vows, everyone noticed it before Ben and Shannon. The couple and the pastor had the lake and the rosé sunset behind them. Darkness rushed over the sky in the time it took to say, “I do.” Clouds from beyond the treeline mobbed the dusk without even a warning shot of lightning. I felt wind like breath on my neck, then rain down the back of my dress, and then Justin’s leathery hand in mine as we ran toward the rattling trees. I looked back for Shannon. In the middle of the storm, I saw Ben take her waist in both hands and kiss her. I hope the photographer captured the moment. We gave the water levels a month to fall before we drove to the other lake, Tuttle, on the border of Pottawatomie and Riley Counties. We had trouble finding the current Randolph, let alone the original, so we pulled into a Casey’s to refuel. Justin struck up a conversation with the cashier while I used the bathroom. When I came out, I began looking through the snack chips for guilty pleasure food. I heard Justin sneaking up behind me, but I pretended to be really interested in Zero bars. I heard a crackle of foil and turned around. We beached next to a burned out washing machine. The water had been just too deep to wade across. We walked on the bottom of an empty fishbowl. My rubber boots squawked in the mud. We slogged past parking meters. We had found Old Randolph. One three-story building loomed above the town. Some bricks still had a coat of blue paint. We could make out a faint ring of white, with a tail extended downward, through the grime. It might have been the lightning-sun logo. Justin approached the structure with me. We walked up to the doorway. I could feel his sweaty fingers around my hand. From the lintel of the building, we saw a single intact staircase headed down into a submerged basement where we couldn’t follow. Our own basement flooded when the sump pump broke. It only ruined a box of old cards, including the postcard, but more importantly the thank-you note Ben and Shannon sent us after the wedding. I shredded the T-shirt into rags. Justin took them and, in time, used every last one to wipe stink bait off his hands. Currently, I work at a library in Emporia, Kansas, in the middle of the Flint Hills. My fiction has been accepted for publication in Mad Scientist Journal and has appeared in Touchstone. Recently, I placed fourth in the Gettysburg Review's Six Word Twitter Contest. Read more articles by Aaron Heil. All original work attributed to Aaron Heil © 2017 Aaron Heil.